Spring has come to Yordie’s Zen Garden but with the change in weather, change is in the air. In recent weeks, Taka has been working on a beautiful new look for the teahouse that sits on The Meandering Pond. 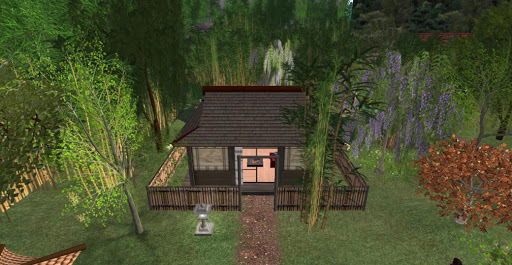 Hmmmm… seeing as I have names for most everything at the garden, maybe the teahouse should have a name too. How about this, The Teahouse of the August Moon? Hmmm. 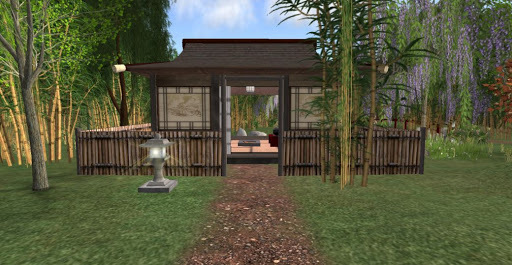 This teahouse defnitely needs a name because Tak has taken the basic style I created a year ago and added a new roof plus a beautfiful selection of woods and colors. 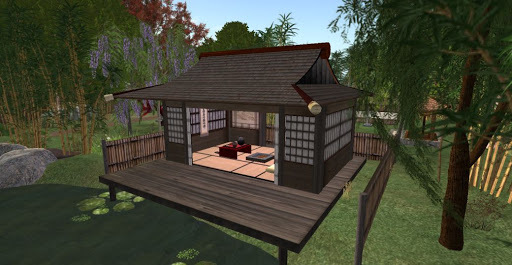 The sytle is the same, a small, relatively low roofed teahouse that opens up on the waters of the pond. There is still the desired weathered look to the house, but with new cut glass windows replacing dull rice paper windows, and with beautiful brown woods replacing weathered gray, the looks is very new from the front. And viewing the teahouse from behind, the warmth radiates outward. I’m biased of course, but I think Tak is incredibly talented (and he has even more amazing designs he’s working on). Spring has come to the garden and look for more changes in the coming days. FYI, this work on the garden is OOC. I understand that sometimes it is hard to differentiate the story of The Samurai & the Geisha from the general goings on at the garden. 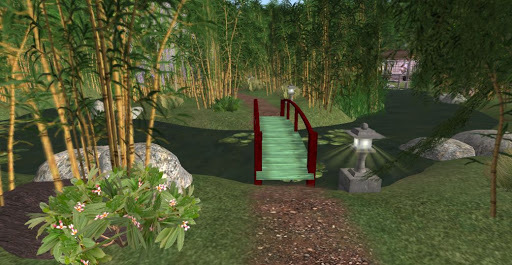 This entry was posted in Writing and tagged Photography, Second Life, Zen Gardens. Bookmark the permalink. Awesome job Tak….i don't know how you found a way to add to the garden's beauty but you did.Smiles. Oh that looks just gorgeous. Must be nice to live there. Good for the soul to have all that beauty around you.